The eponymous New River is in fact a 400-year-old man-made waterway that was designed to bring water to London from two chalk springs in Hertfordshire, and does so still using only the force of gravity, built on a gradient of about five inches per mile along a 38-mile route. This extraordinary feat of contemporary engineering came under the threat of abandonment at numerous stages of its existence, but it survived, and in fact the ‘river’ continues to function as part of the Thames Water network. 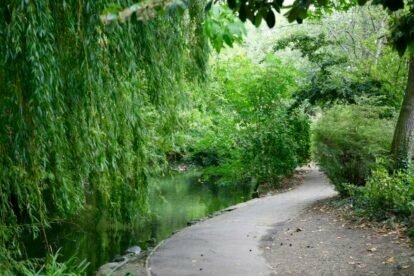 Though its course now ends at the reservoirs in Stoke Newington, it originally flowed as far as Sadler’s Wells, which brought it through the leafy part of Canonbury where New River Walk now stands. This stretch of the original aqueduct is now a narrow but beautifully landscaped park; a meandering path is dotted with benches along the water’s edge, with many an industrious coot or moorhen in year-round residence beneath weeping willows and the occasional bridge. Even the fastest-paced of Canonburyites seem to go out of their way to include it in their commutes. I wouldn’t suggest travelling across London for it, but I enjoy visiting the park when I’m sampling the daytime delights of nearby Upper Street or Essex Road (check the Almeida Theatre, Bellanger and Flashback articles); if you’re nearby and feel like a moment of nature-filled calm, it’s well worth a detour.